Our everyday bouquets are designed with a bespoke combination of high quality seasonal blooms, matching the colour palette and textures to the outdoors. We custom design a new collection of bouquets fresh for each season so you can be sure you'll enjoy something different every time. We are conscious of our environmental footprint and we aim to source our flowers as free from pollutants and plastics as possible, then delivered to you in ecologically responsible packaging. Our focus is to provide a naturally beautiful, long-lasting gift or occassional bouquet at an affordable price, that also treads lightly on our environment. Fresh cut flowers have the unique ability to brighten up any space, lift the spirits and leave a lasting impression to be enjoyed indoors all year round. Each naturally beautiful bouquet is created with a select mix of quality seasonal blooms, collected farm fresh and wrapped in responsible packaging. 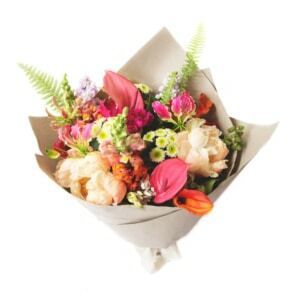 Place your order in the morning and receive beautiful flowers that same day! Or conveniently schedule deliveries in advance for frequent and gifted flowers. Schedule in advance when and where to deliver your flowers so you don't miss a date! We'll let you know when a new seasonal design is ready! Join the Mailing ListYes, Please!